TAHOE CITY, CA JUNE 11, 2014 Sometimes it doesn’t matter how the weekend starts, it matters how it ends. In Tom Wayes case, the Weathertight, BFGoodrich Tires, 3D Concrete #321 ended on the podium with the first place 2014 MetalCloak NorCal Stampede trophy. Coming into the race Wayes was sitting in 2nd place in National Points trailing Healy by a mere 52 points. 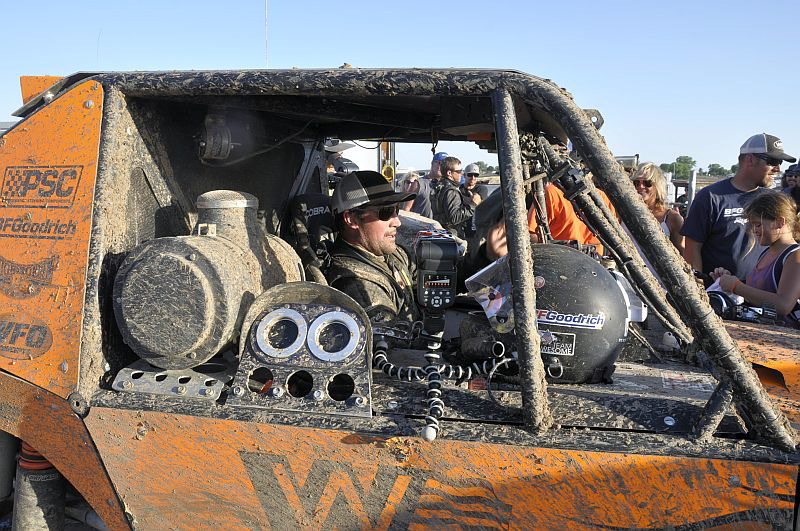 A challenging season to start, Wayes was the 2014 King of the Hammers fastest finisher until penalized to 7th for a navigation error, then as the 6th place finisher at the Arkansas Eastern Series race he added some momentum later in the day when he won the SRRS vs Ultra4 shootout in Hot Springs, Arkansas. With Tom Wayes first ever Ultra4 win at the NorCal Stampede, Wayes is now 1st in the National and Western Ultra4 Series points. Wayes next race will be the East Coast Series UMC Badlands race on June 29th. The weekend started with a win in the plan, but the plan went horribly wrong from the beginning. Wayes showed up early enough to walk the track and start memorizing it before getting into the car. When it was time to set lap times for qualifying starting positions, Tom was sitting 6/10th’s of a second ahead of the field even with a failing power steering pump that was tired from being in since last season. He pulled off the track, changed it to one with a slightly different flow matching the new Advance Adapters atlas race case, made a few adjustments to the Fox Shox, then went back out to continue to increase his lap times. While clearly leading the times, with 15 minutes left, he got out of shape getting sucked into the high grass sending the car into a bicycle motion. Landing on the front left BFGoodrich tire, all the damage was done to the driver side including breaking the a-arm off at the bulk head, sheering the shock bolts, and he broke the flex plate. Tom hit so hard he chipped his back molars spitting blood for a couple hours. His hopes of qualifying on Friday were done. Focused on fixing the car, the WFO Concepts pit crew attacked and fixed the front end while Tom drove to Kevin Yoder’s barn to get a replacement flex plate. The diligent working team was wrapped up ready to race again by 11pm Friday night. Saturday proved to be just as challenging. Lining up for the LCQ, the car wouldn’t move an inch and he was towed off. The drive-by-wire gas pedal got over extended in Friday’s crash and when the green flag was thrown the car would only idle with no throttle response. Wayes jumped out of the car, tore the hood off and jerry rigged it enough to get the car back to the pits where the crew could change out the pedal. He was able to get back out on the track, and would eventually finishing 5th, not good enough to make it into the A main. The B Main would be his last opportunity. Wayes was last in line and conscious of getting into the first place position and then conserving the car to make it into the main. He won the B Main, giving him the opportunity to race for the win. 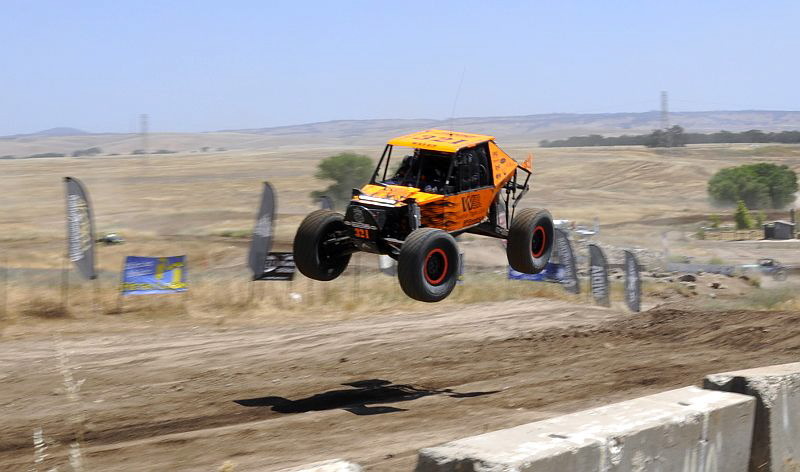 Final results of the Ultra4 Western Series Metalcloak Stampede in Prairie City on June 7th is available at www.Ultra4Racing.com.